The Dovecraft Robot stamp is sure to be popular with kids and grown-ups alike. Try using the outline of the robot to decorate the back ground paper, then stamp and cut out the robot for the centre of the card. 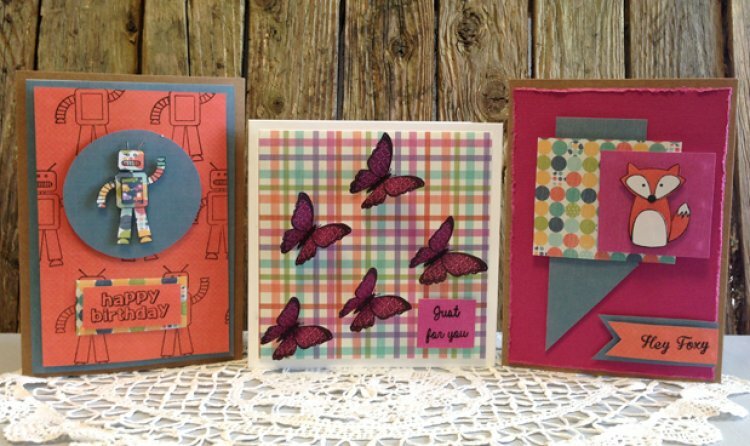 Add a touch of 3D to your cards, stamp the butterfly on to patterned paper, cut out and bend the wings up. Glue onto your card. Easy to create and really effective. Foxes are very on-trend at the moment and we love this cute Dovecraft stamp with sentiment. Try a decoupage effect by stamping and cutting out on various papers, then layer the detail on the card for a great effect. We have plenty more designs in the Dovecraft stamp range, show us your stamping projects in the project gallery.